Born in Lisbon, Portugal, St. Anthony's original name was Ferdinand de Bulhoes and was born to a family of knights of the king. Though he was known as the Doctor of the Gospel, the greatest works in St. Anthony's life were ones of profound charity. He first joined Augustinians in 1212 but later transferring to the Franciscan order in 1221. He took upon himself the name of Anthony and was sent to preach to the moors. But he had to return because of a profound illness. Known as a great preacher, St. Anthony was one of the first Franciscans to not just be a monk but a priest. In the early days of the Franciscan order, few monks became priests because of St. Francis's concern that it would affect their ability to practice humility. 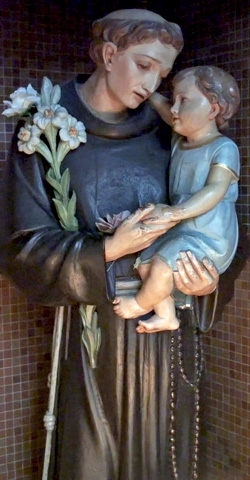 But St. Anthony entered the Franciscan order after he had already become a priest. Over time, St. Francis realized that St. Anthony's gift of words was a blessing to the Franciscans and knew that St. Anthony had no problem maintaining his humility while utilizing this gift. After a terrible shipwreck which sent St. Anthony and a companion to Padua instead of their original destination wherein he discovered that most of the fathers and men had been taken to debtor's prisons, leaving women and children at the mercy of a band of hooligans. It was St. Anthony who organized a group of monks to join together and work to pay off the debts of fathers and husbands who were in debtor's prisons so that they might rejoin their families. Dear Saint Anthony, after all these years in the school of Christ, I still haven't learned the lesson of true humility. My feelings are easily ruffled. Quick to take offence, I am slow to forgive. Saint Anthony, Example of Humility, teach me the importance and necessity of this Christian virtue. In the presence of Jesus, who humbled Himself and whom the Father exalted, remember also these special intentions of mine.